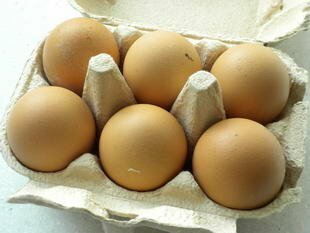 Eggs (we no longer specify that they are hens' eggs these days) are used widely in cooking and patisserie. They may be one of the ingredients (in a dough, sauce or dressing, for example), or the main ingredient, as in an omelette or scrambled eggs (oeufs brouillés). Do buy your eggs as fresh as possible (check the laying date) and the of best quality. Contrary to popular belief, eggs do not need to be kept in the fridge; room temperature will do just fine.